Protect Your Tools, Your Toys and More by Insulating Your Baton Rouge or New Orleans Metal Buildings. Here in Southeastern Louisiana, many Baton Rouge and New Orleans residents choose metal buildings to store items that just won’t fit in their homes or garages. And while metal buildings might not be the most aesthetically pleasing structure on your property, they can be among the most important. If you’re a business owner, you likely store your businesses equipment, tools, lumber, etc. in your metal building. Depending on your line of business, you may even work inside your metal building. And if you’re a recreational enthusiast, you may store a precious – and expensive – piece of recreation equipment in your metal building, such as an RV, camper or boat. Whatever the case, the items you store in your metal building deserve proper protection. Unless you’re new to the Baton Rouge and New Orleans areas, we don’t need to tell you that down here, we experience hot and humid summers, and cool and brisk falls and winters. Unfortunately, the extreme temperatures that we have here in Southeastern Louisiana can wreak havoc on the important items you store inside your metal buildings. That’s where Mr. Green Jeans and our metal building insulation experience come in. 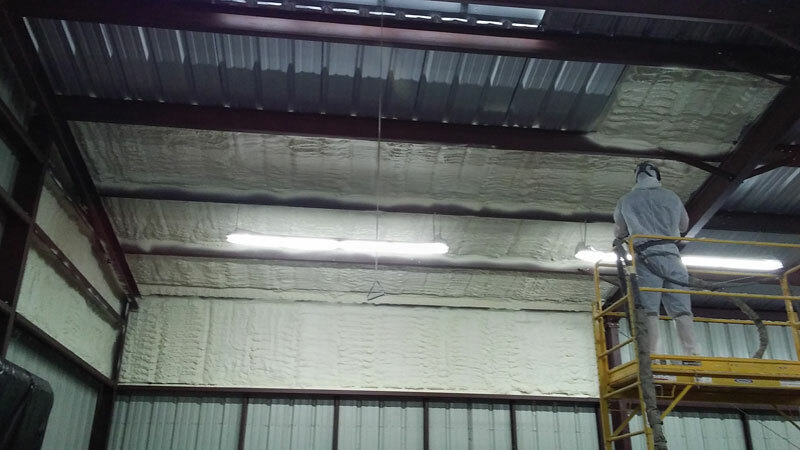 For years, we’ve been helping Baton Rouge and New Orleans residents protect the goods they store inside their metal buildings by finding the perfect insulation solution for them. While we try to provide as much information as possible on our website so you can be fully educated on our processes, the truth is, when it comes to metal building insulation, there’s no one-size-fits-all solution. The insulation type and process that we’ll recommend for you will come after a free consultation, during which we inspect your metal building, including it’s measurements, and gain a clear understanding of the types of items you’ll be storing in it, or if you’ll be frequently working inside your metal building. When you work with Mr. Green Jeans, you’re choosing to work with one of the most experienced insulation teams on the Gulf Coast. Each of the insulation applicators we employ has insulated over 5,000 buildings and structures. That’s a track record you can trust! Whatever precious items you store in your metal buildings, we want to help you with metal building insulation so you can protect those items for good. To get started on the process, reach out to us for a free consultation and quote. We can be reached at (225) 644-0548 or click here to schedule your consultation online.